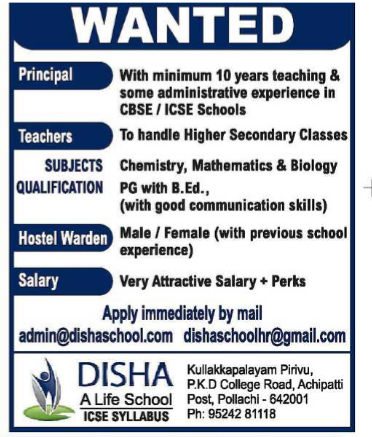 Disha A Life School, Pollachi,Coimbatore has advertised for the recruitment of Teaching Faculty- Principal,Teachers jobs vacancies. Interested and eligible job aspirants are requested to apply immediately.Check out further more details below. 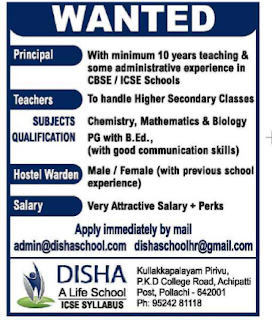 Name of the School: Disha A Life School,Pollachi,Coimbatore. About School: Welcome to DISHA - a forward-focused, coeducational, international, day / residential school with a holistic approach, offering the ICSE curriculum. With 18 years of service in the field of education, we, at P.K.D. Trust, feel immense pleasure in offering to society our new educational initiative-DISHA, where children can realize their true potential and long-term dreams. DISHA - A Life School is located in the beautiful and green environment of pollachi. It is 40kms southwest of Coimbatore. PG with B.Ed.with good communication skills. How to Apply: Candidates must send their detailed resume to mail immediately.